Source for this information is from the excellent book “Marthe Robin- The Cross and the Joy” by Rev Raymond Peyret, 1983, Alba House Publishers –Society of St Paul. Imprimatur R. Glas, Vicar General, Valence, availible from Alba House-St Pauls here. Marthe Robin was born on March 13, 1902 in Chateauneuf de Galaure, France in a region known as “the Plain”. She was one of six children. Her father Joseph, was a good natured farmer, not very religious in that he only went to Mass on Easter and big Feast days, although towards the end of his life, due to Marthe’s extraordinary example and virtue, he had a deep conversion and “died a saint” according to a statement made by Marthe. Her mother, Amelie-Celeste Chosson, was happy and gracious housewife and mother, and like her husband, was not initially devout in religious practice, however she too had a deep conversion towards the end of her life, once again presumably through the holy influence and example of Marthe. Beginning in May, 1918 at age 16, Marthe began experiencing painful headaches. On November 25th she collapsed in her kitchen and was unable to get up without assistance. The Doctor was sent for and it was thought that she had encephalitis. At times she would often cry out in pain. During this time she had her first vision of the Blessed Virgin Mary; her sister Alice who was in the bedroom with her, saw a great light that surrounded the room, but she herself did not see the Blessed Mother. From her childhood, Marthe always had “conspicuous” religious devotion and tendency; conspicuous in that her parents and family were not very devout Catholics; only going to Mass on major feast days. As her illness and suffering progressed, her legs weakened, and she was confined to a chair more and more. During this time her spiritual life blossomed and she was very inspired and edified by the life of the “Little Flower”, Therese of Lisieux, who was canonized on May 17, 1925 by Pope Pius XI. Later that year, on October 15, 1925, the Feast of St Teresa of Avila, she felt inspired to make a “Act of Abandonment to the Love and the Will of God”, composing the text of the Act of Abandonment herself. Barely a year after having made her act of abandonment to the will of God, Marthe again fell gravely ill. It was on October 3, 1926, the day of the first celebration of the feast of Saint Therese of Lisieux, who had been canonized the preceding year. Dr. Aristide Sallier, of Saint-Uze came to The Plain and found Marthe in a coma. "There is nothing more that can be done," was all he said. The Parish Priest, Fr. Faure could only replace the doctor at the bedside to administer the Sacra­ment of the Sick to "his parishioner," as he called her. It was the second time that she had received it. Everyone expected that each day would bring her death. The coma lasted three weeks. 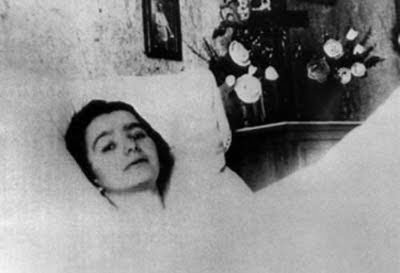 But while death seemed to be imminent, Marthe experienced three apparitions of Saint Therese of the Child Jesus. 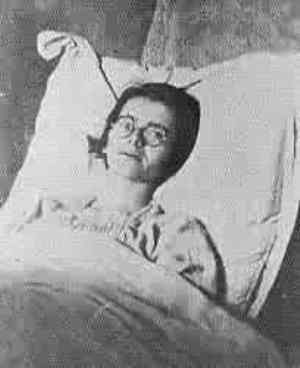 The Carmelite of Lisieux revealed to her that she would not die yet, that she would recover, and that she would extend her mission throughout the entire world! That is what Marthe confided to Fr. Finet, even adding, laughingly, "Oh that rascal, in the end, she's left it all to me!" Behind the suffering and the mysticism, this sense of humor is the best indication of Marthe's mental health. “....it was impossible to make the least movement without the assistance of my very devoted mama, not that I did not retain at least partial use of my arms and my hands, but that they had become very clumsy. Nevertheless I thank the Good God for everything that He sends me, and particularly for His having left me at least this last mobility, as some consolation to my dear parents, and so that I may perform a few light tasks for them. Oh, that I may never work except with Him and for Him! Still, I feel that I am crushed, both physically and mentally. Everything causes me anguish and overwhelms me ... I no longer know how to react. But so be it! But too much-too much about my poor self, and it seems it would be better for me to dwell more upon all that God is doing in my soul, and for my soul, every minute...."
"My soul is plunged into and, as it were, swept away toward that Jerusalem of Love, by the powerful allurements and inspirations of God Himself, who now and then seems to desire to absorb me wholly into Himself. I am afraid of all this! ... I am so alone, spiritually and mentally, and meanwhile I understand that I must abandon myself to Him without any reservations. So be it! I have so much need to say this "Fiat" often, which unites me with Jesus, and with Mary, my most beloved Mama, and consum­mates my immolation. "It seems to me that I am no more than a very tiny thing in the arms of God, and that I will remain so until I die ... I do not know what He wants to do with me, but I desire it all. Everything is good that comes from God and that He wants of us. Yes, all is good to me ... All is infinitely dear and sweet to my soul because it is He who wishes it so, He who manages it all. I take refuge in His heart, united with Mary my Mother whom I love so much, and I shall not leave it any more ... I know that He will not expel me." (March 2, 1927). 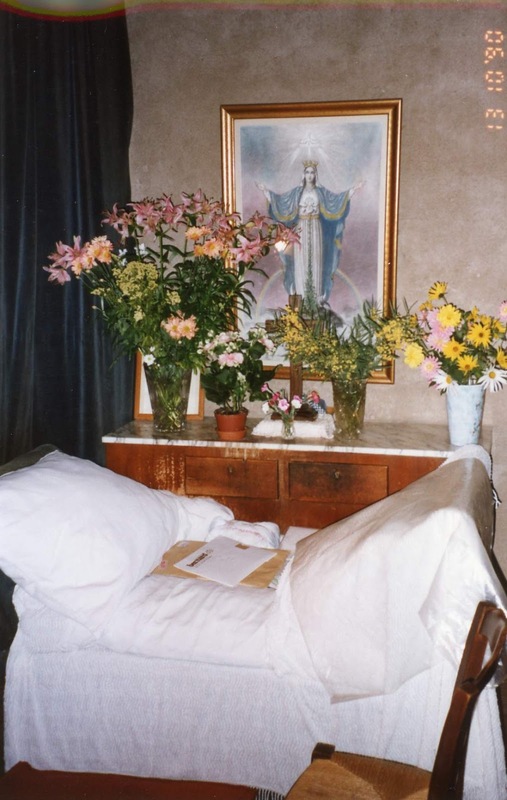 As of March 25, 1928 (Feast of the Annunciation) Marthe's legs became completely paralyzed. Hence­forth she was bedridden for life. She lay in the room next to the kitchen and which faces onto the courtyard. Her legs had contracted and twisted out of shape. We leave it to the reader to contemplate such a experience. This time of her paralization also coincided with an extraordinary grace of total abstinence from all food and drink. This extraordinary phenomenon may be incredi­ble, but it has also been known in the cases of other mystics. From 1928 to 1981, the year of her death, Marthe did not consume anything except the Eucharist that was brought to her once or twice a week. The host, entering into her, instantly disappeared without any normal ingestion. Marthe could not swallow anything else. As far back as the beginning of that year, when her mother had brought her a cup of coffee, it had immediately flowed back out of her mouth. Mrs. Robin groaned, "Look at my poor little one, in what a state she is!" And Marthe's father wept, "But she has done nothing bad!" He was pitiful, a childhood friend of Marthe's told me. Thenceforth, Marthe had no ingestive or digestive processes whatever, and, in addition, she entirely ceased to sleep; she was completely stripped. According to medical men, a total loss of sleep is even more extraordinary than not taking any food or drink. We can assume that one does not enter into such a state without agony. It appears that at this time Fr. Netton began to come to visit and console Marthe. And it was at this point that the Blessed Virgin began to increase the frequency of her appari­tions. Late in the year 1928, two Capuchin Priests who were preaching a Mission in her hometown were visiting all the sick in their free time. When they met Marthe they were quickly impressed by her devotion and her resignation and acceptance to her paralysis. When they returned that day to the Rectory of the Church, they said to the Pastor “that is a Saint that you have there!” Encouraged by these holy Priests she felt called to join their number by entering into the Third Order of St Francis on November 2, 1928. But the Enemy, of whom the Evangelists speak, began to harass her. The Lord had said to Satan, "Have you noticed my servant, Job, and that there is no one on earth like him?" We can wager that he would have been able to say the same of Marthe. Satan was so enraged after her entry into the Third Order of Saint Francis, that on the very night after the ceremony Marthe ex­perienced her first manifestation of the devil. Mrs. Robin, who slept in a bed just beside her daughter's, said, "I don't know what happened, but she uttered a frightful scream!" "Satan," a confidant of Marthe's reported, "had struck her a blow with his fist, breaking two teeth. It was she who told me." "Did you see the broken teeth?" "Yes, yes." This same episode was related by Fr. Perrier. The paralysis of her legs occurred on the feast of the Annunciation, 1929. On Candlemas Day, February 2, 1929, Marthe lost the use of her hands. She had offered them to the Lord, and he had taken her at her word! Goodbye to letter writing and to embroidery! "I kept my thimble on my finger for about a week, and finally I said to mama, 'You know, you must take off my thimble, now!' " Undefeated by this new paralysis, Marthe learned to write with a pencil in her mouth. Thus, at age 27, this is the state to which she was reduced: her arms and legs held her down in her bed; her legs were partly bent; she was twisted, with a pillow under her back, and a stiff cushion to support her knees; her right arm lay across her chest and her left arm was stretched out along her body. She could not move. When Mrs. Bernard (the daughter of Mrs. Ferdinand Robin) went to help Mrs. Robin to change the bed linen, Marthe endured torments as soon as she was lifted. In this uncomfortable and unchangeable position Marthe remained, without drinking, without eating, and without sleeping, for more than fifty years. "Oh Jesus, you have made me your little victim," she said on July 12, 1929, "as you have wished to be mine, and that of all mankind. All my life, oh my God, is yours ... oh Cross, Cross of my Savior ... oh divine ladder that joins earth to heaven, you are the altar upon which I must consume my sacrifice and consume my life in immolation and love. " Towards the end of September, 1930, Jesus appeared to Marthe and asked her “Do you wish to be like Me?”She did not know exactly what our Lord meant by this, but recalling that she had offered herself completely to Him five years earlier, she wanted everything that He wanted. She at once made her “fiat” with all the love and devotion of her heart. Sometime during the early part of October (possibly on the 4th, the feast of Saint Francis, the stigmatized saint), Jesus Crucified appeared before the eyes of Marthe. At once he took her paralyzed arms, rigid since February 2, 1929, and opened them wide. At that moment a tongue of flame leapt from his side, separated in two, and struck both of her feet and both of her hands; a third tongue of flame struck Marthe on the heart. She bled from her hands, her feet, and her heart. Later, whether it was the same day is not known, Jesus imprinted his crown of thorns on Marthe's head. The marks extended down to her eyes and bled freely. This crown appeared on her forehead "like purple veins"; several months afterward (at Marthe's request, as an act of humility) they completely disappeared. Still later, Jesus intervened again, imposing upon Marthe the wood of the Cross; Marthe felt crushed-dislocated because of the burden of the Cross with its enormous weight. Her parents saw their daughter covered with blood, and were overwhelmed. According to Marthe, her mother "understood that this condition had come from God with Marthe's abandonment to the Divine will." Her parents nevertheless called for Dr. Aristide Sallier of Saint-Uze. His medical studies had obviously not prepared him to cope with such a phenomenon. Right away, he tried to have his patient drink something. It was impossible; the liquid came out through her nose. The doctor recognized that he had come to the end of his resources. One day he acknowledged his helplessness, and said to Marthe. "Mademoiselle. pray for me!" On the Friday following her stigmatization, Marthe began to relive the Passion of Jesus. Rumors of these events did not take long to circulate throughout the neighboring countryside. and soon a number of people were "ascending to The Plain" to see Marthe and to pray with her, uniting themselves through her with the Passion of Christ. This apostolate of welcoming visitors for the good of souls continued for 50 years, that is, until the end of her life. Fr. Faure and Fr. Perrier were the first to organize such visits for the edification of the souls of the parishoners entrusted to them. The visitors so increased that, beginning in 1931 or 1932, the permission of Fr. Faure was needed to "ascend to The Plain." Why Fr. Faure's permis­sion? Simply because the Robin family would have been too embarrassed to refuse anyone admittance to their home. Already, a ritual had spontaneously come about: one awaited one's turn in the kitchen in the company of Marthe's mother, whose patience was touching. Finally one entered Marthe's room, chatted with her, and showed her the gifts one had brought, not only the oranges that people habitually gave (for the sick, since Marthe neither ate nor drank), but all sorts of things that Marthe then had the pleasure of sending to the poor and to missionaries. This was the origin of what todays retreatants at Chateauneuf call "Marthe's basket. "—gifts that Marthe sent to the poor and missionaries. "Here is the end of the year 1930," she said on the night of December 31st, ”My whole being has undergone a transformation as mysterious as it is profound. A year of trials, a year of pain. A year of graces and of love. My real joy on my sickbed is profound, lasting because it is divine .... I reflect upon the road I have traveled since the beginning of my illness, and from this reflection emerges only Love, and gratitude towards God who is so merciful and so good. What a labor! What growth God has wrought in me! But what leapings of the heart, what death-struggles of the will it takes to die to self!" The ever increasing number of visitors, the glimpses of glory (' 'It was so beautiful up there") must not make us forget that Marthe continued to suffer every day, unceasingly and more and more painfully. Right up until 1981. One can scarcely imagine that this Calvary lasted fifty years. Marthe suffered in her body. Even when the bed linen had to be changed it was necessary to take all sorts of precautions; despite them, Mrs. Robin and Mrs. Ferdinand Robin (who came to help) knew well enough that they caused her great agony. Marthe suffered also in not being able to eat or drink, not because she had taken some vow, as is sometimes said, but because she had no salivation and no power of normal ingestion. Her sole nourishment was the Eucharist. For fifty years Marthe lived only by means of it. Marthe suffered in her heart to see that her parents were tormented by not being able to do anything for her. Above all, she suffered in her soul because the sin of the world is hateful and because Love is not loved. And this spiritual suffering was at its greatest every Friday when Marthe relived the crucifixion for so many years. Later, the agony of Christ began for her on Thursday evenings. "He desires to relive in me His Passion up until his last breath and His descent into hell, and even his resurrection, although I remain on the cross so as to continue this life of crucifixion that is His will for me; that He wills for me for his glory and for the redemption of souls all over the world. " Fr. Finet more than once told of his pathetic dialogue between them that preceded her entry into the agony of the Passion: "Father, do you know that today is Thursday'?" "Yes, my child." "You know, Father, that this evening ... " "Yes, my child." "Father, I worry I will not be able to bear it." "Yes, yes, my child!" And, little by little, during the course of the day on Thursday, Marthe increasingly felt the pangs of the Passion. She was in combat against the infernal regions unleashed, against the Devil, who beat her head against the furniture near her couch. And Marthe wept tears of blood. Like Christ at Gethsemane, she carried the sins of the world. She was overwhelmed and horrified; she became sin. Sometimes she would say to Fr. Finet, "Do not come near me! I will make you dirty!" She groaned, unable to say any more. The torment continued from Thursday night throughout the whole of Friday. Marthe relived all the scenes of the Passion. This drew to a close with confidence and peace in God, on Friday night at hours that varied, when she cried, "Father, into your hands I commend my spirit." She would have a great sigh; her head fell to the left, then backwards. It was finished. One would think she was dead. She was in ecstasy. Then on Saturday she came to herself. Sometimes it was not until Sunday, or (in the last years of her life) only on Monday morning, or even Monday afternoon. One of the Divinely inspired projects in the heart of Marthe Robin was to build a Christian school for girls. Her spiritual director, Father Faure felt this project was doomed to failure, because the town and in fact the whole region was quite overrun with “free thinkers” who were not in favor of Christian schools. It took two years for her to convince him to make the first steps for the project. He consulted all the Priests of the Canton, 17 at that time, and 16 of the 17 thought the idea was “crazy”, given the prevailing spiritual climate of the area at that time. To summarise the story: The building that became the Chateau was purchased and renovated, and on October 12, 1934 the Chateauneuf de Galaure school was opened. As of today, the Chateauneuf de Galaure boasts two secondary schools and an agricultural school, with a total of about 1000 students. 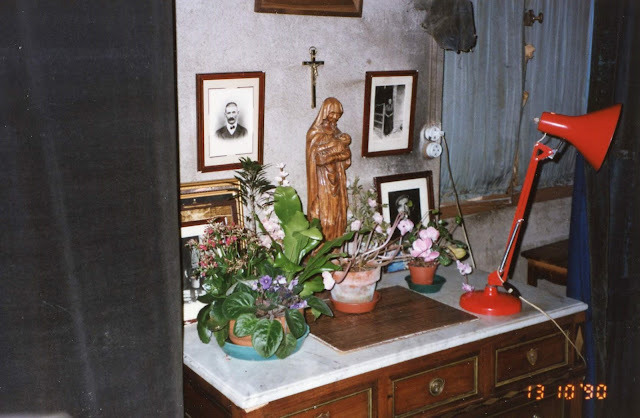 The second Divinely inspired project in the heart of Marthe was the “Foyers de Charite” (Houses of Charity) , which where something totally new in the Church—they are retreat houses built and organized by consecrated lay people, and directed by a Priest. The first Foyers de Charite retreat took place on September 7, 1936, preached by one of Marthe’s close friends, Father Finet. As of 2006, there are 75 Foyers in 41 countries. After 50 years of suffering in union with Jesus for the conversion of souls, Marthe Robin entered her eternal reward on the First Friday of the month (devoted to the Sacred Heart of Jesus) February 6, 1981. “I am Thy prey, oh Jesus, in the Cross and in joy, in cruel trials and in sharpest pain; oh how sweet it is to suffer when it is a sacrifice to Thee! And when one has as one's sun the great fire of Thy heart. I know where love dwells, I have seen the shining of Its flame, And for Thy heaven, oh Jesus, I would gather flowers. Painful torments bloody my soul, but unceasingly I repeat, 'I thank Thee, my Savior." "Oh Virgin Mary, let me each day be more docile, more patient, more simple; unnoticed and forgotten. I do not ask that God bring about in me things that are visible, but only that I be a small, lowly child, sweet and humble of heart." "My Lord and my God, to You I abandon myself. You wish me here, and here I shall remain, with no thought of leaving; if you wish me elsewhere, that is what I too wish. I know, oh Jesus, that always and everywhere You are saving me for yourself. Oh my Jesus, how thy little victim suffers, but how she loves Thee, with as much love as she has received ... oh Jesus, keep me always. I belong to Thee; give me patience and peace in everything." ~Marthe Robin, pray for us! 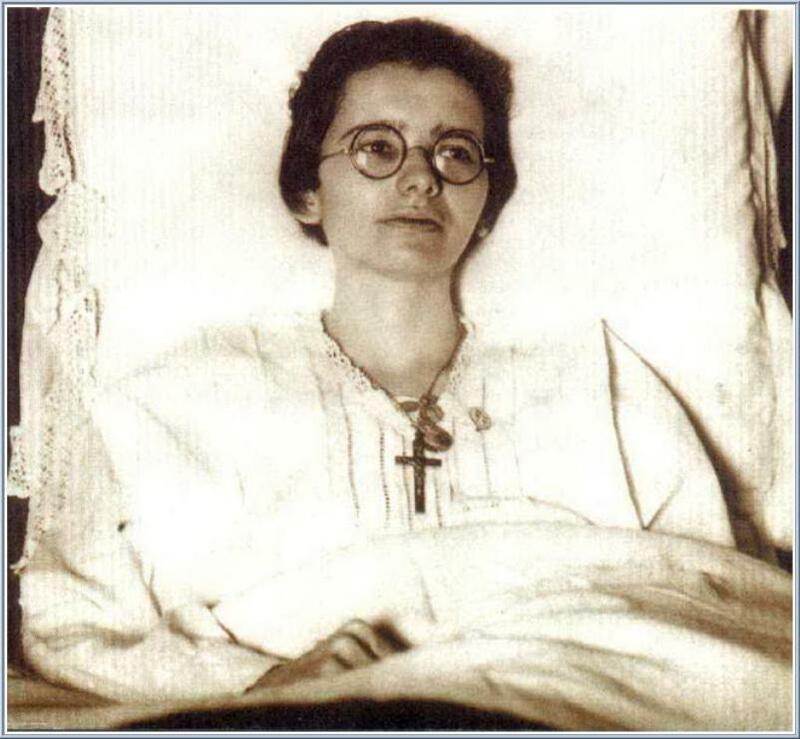 Marthe Robin, please continue to pray for us, for the conversion of sinners. Please pray that my family, relatives and friends be saved. 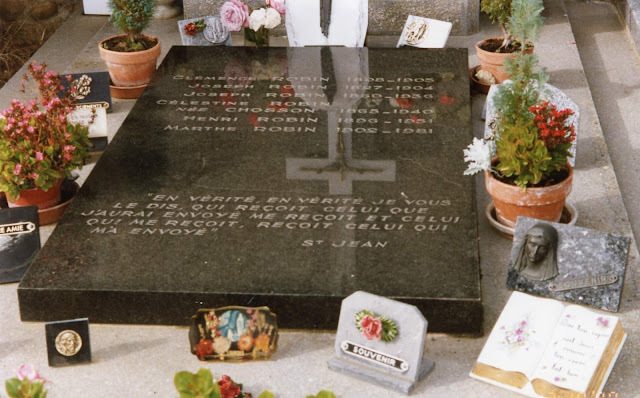 The book “Marthe Robin- The Cross and the Joy” by Rev Raymond Peyret is the first book written about Marthe Robin. It contains several historical errors. A more critical biography has been written since, but is, as far as I know, not yet available in English. You may want to refer to "Marthe Robin and the Foyers of Charity" by Martin Blake, Nottingham, England: Theotokos Books, 2010. God bless ! I was not aware of the book that you mentioned. Thank you so much for the information! Beloved servant of God, True image of crucufied'Cristh, pray for the salvation of all sinners, above all my enemies, and for my salvation. May God be loved through you. Dear Marthe Robin, Please pray for me and intercede for me because I am horrible at suffering and would rather run from it. Please help me to be humble because I know not how to deal with the terrible pride that lies within me. Dear Marthe, you chose to be my Saint for this year and so willingly gave yourself to Christ, please help me because I am not sure what Our Lord's will is even still and I do not know whether I suffer for Christ now or simply keep deserving His rubuke. I am frightened and can only ask that you pray and offer all of my errors and mistakes to Our Dear Lord, because I am sorry that I have nothing I know of that I could possibly have done right. God Bless You and all of my Enemies. Thank you for picking me this year, you sweet and dear soul. Michael J. H.
It is all true. I went on a one-week retreat (the only ones they gave) at Chateauneuf de Galaure in 1975. It was taught by Fr. Finet mentioned in the piece (it created in me a great taste for theology and was a big jump forward in my spiritual life). Usually the retreatants were invited to go into Marthe's room during the week... the room was in total darkness because light hurt her eyes so much. However, the week of my retreat she suffered so much that no visitor was allowed in. We were told that she would therefore pray even more for us who could not come in her room. The article mentions that the population of the very little lost village where Marthe was... (difficult to get too) was of "free-thinkers". Actually it was more than that: a bastion of communism. Thank you so much for sharing your experiences concerning Marthe Robin. I have a friend who visited Marthe Robin and had the great priviledge of speaking with her for awhile and she left greatly inspired and edified by her experience. Please pray for me Marthe, my life is a complete waste. please let my nightmare at work end, I cannot go back there. Please help me Marthe, I am so depressed and feel such a complete failure. Please help me. Please please help me, I cannot go back there. Please let my life have some sort of meaning. Dearest Marthe, Please pray for Msgr., for my son who is going into the seminary, for my three brothers who are far from God. Pray for my dear friend to be healed of abuse and confusion. Pray for me to do only the Will of God. To all those who have not read True LIfe In God please do. It is a transformation that will send your soul reeling and your heart beating non stop. Dear Marthe Robin, Please pray for me as I embrace my suffering as an offering for the sanctification of our Priests and vocations to the priesthood and religious life. I too hunger for the Blessed Sacrament on a daily basis and offer myself up in union with Jesus during the consecration of the Mass. Please Marthe, servant of God please help me to endure just the vapor of sufferings that Jesus has given me. Like so many people my human nature wants me to run. I too like you want to be in union with Jesus. The greatest blessing Jesus could ever give me would be the conversion of my whole family to His sacred heart. Please pray for me so I can happily endure the sufferings God has given me and to appreciate all the abundance He has bestowed upon me as well. Marthe Robin, please pray for me. 'Marthe Robin : A Prophetic Vision of the Gospel Message' is another excellent book (written by the man responsible for gathering her writings etc., for beatification). To the previous commenter who mentioned the writings of Vassula Ryden: I discourage people from reading her writings. They have received a negative judgement from the Church. Here is a great article (from a holy, learned and orthodox priest) that deals with the discernment of spirits- something needed more than ever in this age where false mystics abound! Thank you Anonymous for your comments and also the link to the article by Fr. Peter Joseph. I have read his article and it is indeed an excellent summary on how to discern visionaries/mystics. The Love for God/Jesus is the foundation of Christianity. Christianity is more a relationship between you and God/Jesus Christ. This is the Love that must from you to me as Christians. The first rule of engagement as a Christian is "to love". The Life and examples of Marthe Robin must be seen from the perspective of her Love for God/Jesus Christ. This is why I will always, say Let Love Lead in whatever we do as Christians. November 8,2014 Pope Francis advanced the sainthood causes for 8 new candidates, including Marthe Robin, believer in Garabandal ! My dearest lovely saint help me to unite my self to Jesus Christ my Lord and Saviour. Pray for me to God to have mercy on me for I am a sinner and I am not worthy to come to Him, but by His mercy I will come to Him always and in all ways. Ven Marthe Robin please pray for my son Randy A to be completely come back to the Lord.I also pray for his success in life and find a good permanent employment. Blessed Marthe Robin: Please pray & intercede for my sons to be re-converted to the Most Holy Roman Catholic Church, also my daughter in law & future daughter in law and my stepdaughters & all of my family. Thank You!!! Marthe Robin pray for my son. Please ask our Heavenly Father to send his angels to protect him from the attacks of Satan. O good and humble soul dear Marthe, help me to embrace my paralysis as a victim for my Jesus as you did. Through your intercession and example, assist me in abandoning my own selfishness to the divine will of God so that I too can follow your incredible surrender of love and humility. I am so far from your example of surrender. I am willing but I pray for a greater detachment from the things of this passing world which only serves to distract and run contrary to spiritual growth. Thank you for your fiat which astounds and inspires souls. Marthe, What a most precious grace I received from Our Mother through your life. Intercede for my life and my assignment. All my trust is in Our Triune God and His Holy and Tender Mother. From Nada z. On this beautiful Monday, March 13, 2017 I would like to say happy birthday to our little blessed Martha Robin!!! May the good Lord raise you up on the altar and make you a saint pretty soon Amen!!! I will pray for you to become a saint! I would like to say how I found out today is your birthday three years ago my spiritual director had gave me a piece of paper with your name on it to read your story I read it a little , but I never finished it. for some reason today march ,13 , 2017 I found this piece of paper with your name on it I decided to read your story and that's how I found out you were born on March 13, 1902! Pray for me and my four children and my husband to become a holy family to be example for others to increase our faith to detach ourselves from this world And to live for Jesus Christ alone! and to help others , To love one another to go to daily mass to be example for others to love our neighbors like ourselves in Jesus I pray ! I love so much Martha your story is incredible it touched my heart it's made me cry so much pray for me please Martha for Jesus to give me the patient and to increase my faith Amen!!! I recently heard of Marthe Robin in a homily during a Mass on EWTN. I found more info- here at your site. The link above for Foyer of Charity does not bring me to any page, so I am posting a link here. Thanks for the updated link Kevin! I just changed the link at the bottom of the article to this one. I read recently that time of mercy will go no later than first 2 decades of this century...... According to mar the. Cannot remember where I read this. Can you clarify if true statement. I love this site and have been very inspired by so many of the beautiful stories, well-thought-out descriptions, and touching comments contained here. It's a treasure trove for spiritual growth, which has greatly assisted me in my own efforts to enhance my feeble spirituality. At the same time, I feel very compelled to comment that this woman defrauded many, and I am dismayed to see her progress toward an errant declaration of sainthood. As is well documented, throughout her life she had shoes under her bed which showed progressive signs of wear, and a bedpan in her room in which she (to me, quite oddly) kept her bowel movements - certainly suggestive of eating. I am also a psychologist. I regret to say that this woman displays all the signs of hysteria, which is now called Conversion Disorder, and shows no indication of any supernatural occurrences outside her own claims. I would even go as far to say she is malingering, which simply means someone feigning an illness for secondary gain (in this case, adulation of millions and complete ability to have all needs and wants catered to by others). 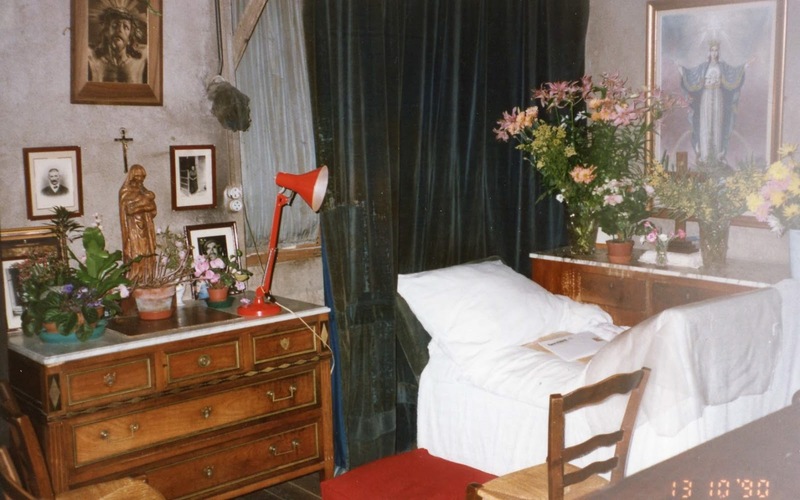 To me, the final straw is another story hosted on this wonderfully comprehensive website, in which individuals travelled from the United States to France to visit Mme Robin during her life. She rejected these visitors because that day her eyes were "too sensitive" to light. This same woman supposedly *begged* throughout her entire life to have *more* suffering, so that she could more closely mimic Jesus. I find it hard to picture Jesus Christ stating that he would be unable to assist certain disciples because he had a headache, or his eyes were sensitive. To be frank, this woman makes me sick. I pray her fraud be uncovered as I believe it is this sort of charade which is leading the Church further and further toward being an object of total mockery. Blessed Mother, protect us against those like Marthe Robin. I am the writer of the previous comment - in reviewing, I think I spoke quite strongly. I've considered simply revising what I wrote, but I feel that would be evading responsibility, particularly for those who may have already read the post. While I do have the opinions / sentiments expressed, I also know that Mme. Robin has been an inspiration to many. Similarly, I take comfort and hope from people whom others may find potentially errant, or perhaps mentally ill rather than holy. Therefore, I'd like to be very clear that I regret if I have offended those people who do believe in Mme. Robin, and I am genuinely glad for those who have found her to be a source of comfort. While we may disagree in the validity of her claims, I believe we can agree on the power of faith and hope. Please pray for me that I may experience joy in my life, presumably by being married, and a good job. Thank you! Dear Marthe Robin, please for the conversion of my son Nicholas Ariho. He is a self confessed atheist even though there are no atheists of that nature in our community. I have been praying for him for many years without any success but I trust your intercession together with that of the Blessed Virgin Mary will help bring him to change. In Jesus mighty name. Amen.